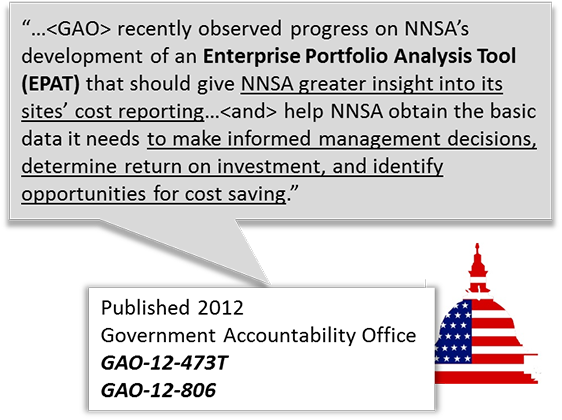 Client’s Challenge: Facilitate / integrate the management of NNSA’s large, complex, and diverse portfolio of mission programs and projects. Provide a consistent framework for planning, programming, budgeting, and evaluation of work required to execute the mission. Provide senior leadership a basis for high-level strategic decisions. What Appsential Does: Leverage Oracle’s Primavera Portfolio Management (OPPM) to create a federated approach to budget formulation, scenario planning and analysis. We successfully integrated OPPM with DOE’s datawarehouse and BI platform for data analysis, reporting, and dashboards. We provided a common framework for justifying activities, formulating & defending the budget, planning/analyzing budget scenarios, and identifying cross program linkages and dependencies. Download our Portfolio Management White Paper to learn more.